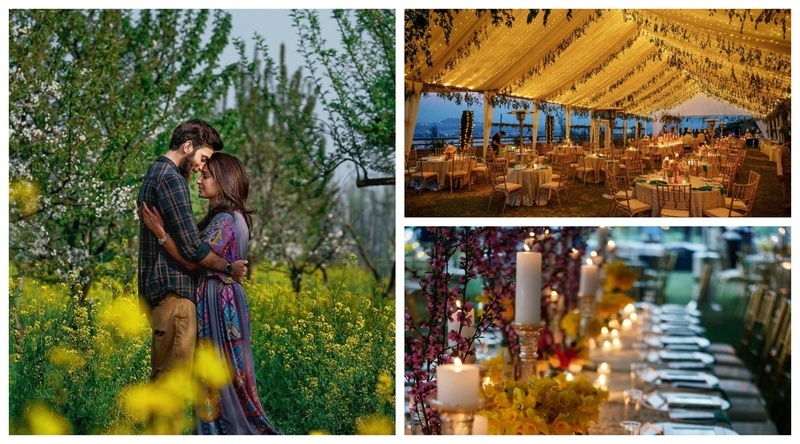 What happens when India's top photographer & decorator come together for a Kashmir Wedding - Pure Magic! That's when I asked my heart, if love exists? And it replied, "Hami Ast! Hami Ast! Hami Ast!" - This is the poem Aamir wrote for his wedding favors! This wedding which took place in the land of paradise and beauty is all that you can expect out of a destination wedding and even more. It’s got surreal and picturesque backdrops, history, an otherworldliness, and a quiet beauty that will leave you gasping for breath. Now, imagine a wedding that’s not only set in an unexplored venue, but also photographed by one of the best photographer’s in the country - Joseph Radhik and decor by the best-est Devika Narain. Miniature Shikharas with the mehendi cones!! Can it be more Kashmir themed? They wanted the mehendi to be colourful, so Devika went for miniature papier mâché shikaaras, crewel embroidered fabrics in pink and aqua, potted plants and local seasonal flowers as centrepieces. Local winter plants and blossoms stood in the middle of dinner tables at the mehendi. The venue for the nikaah was a 200-year-old Jalali House - a heritage site that dates back to 1863 and is a regular site for Bollywood shoots. It exemplifies old-world Kashmiri architecture and charm, with its traditional brick and lattice work, courtyards, balconies (dabs) and colourful windows. Afsha told Conde Nast Traveller, “After getting lost for around two hours, we walked through a door and were transported back in time - there was something so deeply spiritual about it that we didn’t even need to go inside. We knew we had to get married there”. Devika Narain says, “Their nikah was set in a beautiful hundred year old haveli in the heart of the Old city belonging to the Jalalis - a family of doctors and philanthropists. The venue draped by gardens on all sides was decorated with handwoven kashmiri carpets and tuberoses. For once the venue was so perfect that we didn't even mind the lopsided candelabra that looked over the ceremony, almost as if it had a personality of its own :)”. For the reception, the couple wanted a simple but elegant vibe, so Devika’s team created a tented setup - in lawns overlooking tulip gardens and the iconic Dal Lake. They brought in tables for a sit-down dinner, and decorated them with tulips and daffodils, lots of candles, and custom-made frames with poetry by Rumi, Khalil Gibran and—for an incredibly personal touch—by Aamir himself. Table setting at the reception at Vivanta by Taj – Dal View, comprised of locally-grown flowers, where authentic Kashmiri cuisine was served. So, planning on your Kashmir wedding already? Dreamy isn't it? Well it’s left me smitten too! Wedding Design - Devika Narain & Co.